In this fourth post I propose an approach to Douglas Gordon´s work 24 Hour Psycho (1993), handled from the aspects I have been speaking of in previous posts: time and space. The “Expanded Cinema” describes everything that goes beyond the usual technologies of film production and projection, it breaks the literary and static narrative of the unique image of cinema and incorporates visual resources that expand and question exhibition spaces and montage and distribution techniques(1). This apparently simple process reveals a complex mechanism of memory in the viewer, producing a visual and temporal anachronism that allows a void of meaning in the work , and in the symbolic charge contained in it. When lengthening the scenes, Gordon’s intention with this temporary alteration, is to remove the immediate tension that occurs in them, that is, to take the drama out of the film. An inversion is produced, a symbolic void that modifies the viewer’s way of seeing and thinking. Therefore, it changes around the reception and intensity of what is perceived. 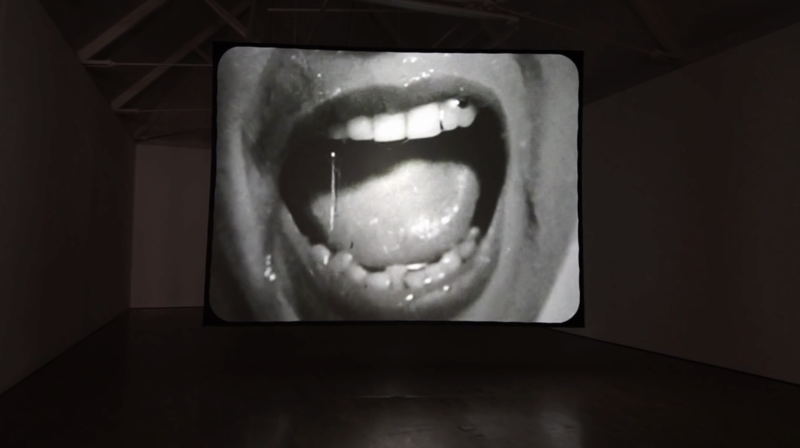 Douglas Gordon appropriates Psycho by manipulating the visual perception of the film by means of temporal resources applied to the projection (scale and space disposition). By altering the temporal structure of the film, he passes off all production of meaning to the viewer’s subjectivity. Now, the problem for the viewer is what he sees in the image, not what will be seen in the following image. Likewise, objects and means no longer have a reality of their own but they acquire autonomy, material value by themselves. The separation between the subjective and the objective is weakened by the replacement of the optical situation by the motor situation. There is an indeterminable, more lax game, focused on daydreaming which generates a kind of oniric relationship, in which the released senses can establish their own relationships. In this operation the viewer leaves the interpreter figure and takes possession of a significant number of images to construct its own translation; what Jacques Rancière has called “emancipated spectator”.